In some ways, I think the sentiments expressed on the card are very helpful. 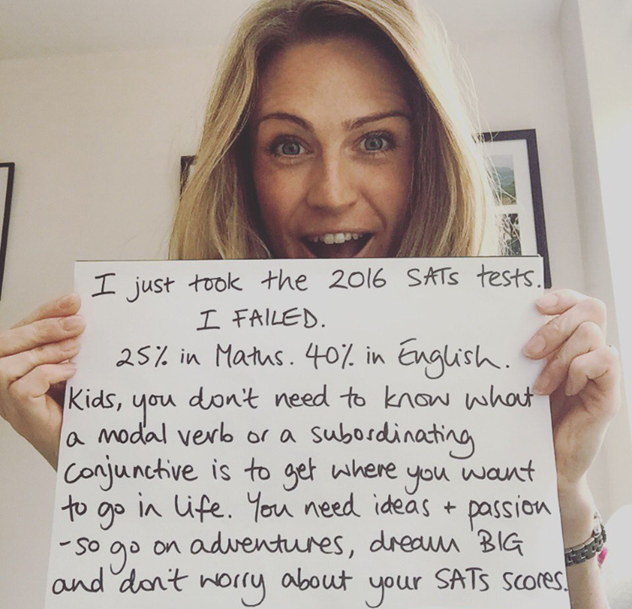 It’s important for students to understand that KS1 SATs results are not wholly defining in any sense: a relatively poor (or, indeed, strong) set of results won’t affect anyone’s chances of getting where they ‘want to go in life’. And, of course, I understand, that it’s important for students to have ‘BIG’ aspirations. I’m a secondary school English teacher, so I have no authority to make sweeping statements about the levels of stress caused by the KS1 SATs on students, parents and teachers. However, I do have a fairly solid point of reference in the form of the upcoming GCSE and A-level exams. I understand how utterly miserable this whole business of high-stakes testing can be – for everyone involved – if the process isn’t managed sensibly. However, I don’t think the tweeted image above, and others like it, although undoubtedly well-intentioned, are particularly helpful. I think we should avoid sending the message to students that ‘ideas’ and ‘passion’ alone are enough to secure future success and happiness. Doing so, to me, is just as unfair and harmful as piling on the pressure. Exams are a reality of our education system and, as I wrote earlier, whilst they are not wholly defining, they should still be taken seriously and not simply dismissed. So, in terms of a conclusion, nothing more than this: let’s tone down the rhetoric and regain a sense of balance. Agreed. I thought KS2 children wouldn’t be reading Twitter but then I saw messages to them from their head teachers. ‘GOODLuck’ ‘ keep calm’ ‘ don’t worry’ call me old fashioned but REALLY? who is the message for?